If you have been following our blog and twitter accounts then you most likely have heard that some of the Web components of Visual Studio 2012 are now “Out of Band”. What that means is that we can update those components separately from Visual Studio itself. Because of this we will be posting updates on a regular basis. 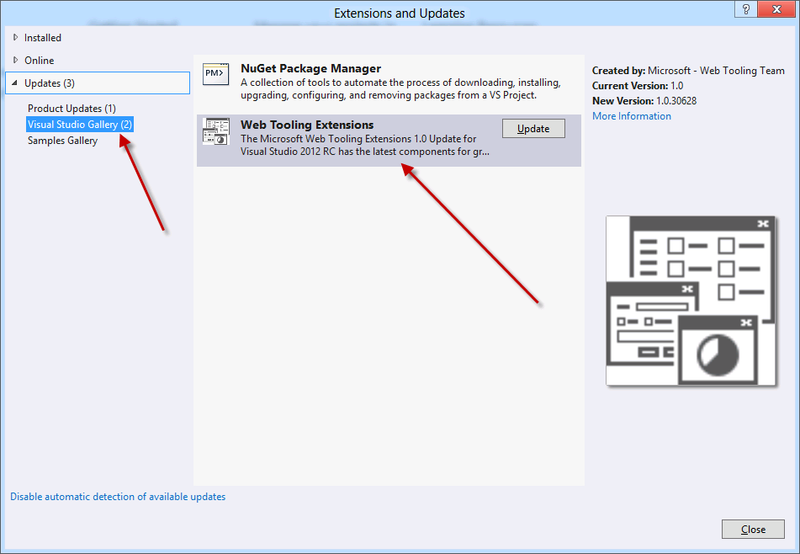 Today marks the first of these updates, and its targeting Visual Studio 2012 RC. In this post I will describe how to get the update and then what the update contains. If you already have Visual Studio 2012 RC installed when you launch VS you will see a notification in the task tray like the image below. After you click on the notification you will be brought to the Extension and Updates dialog. 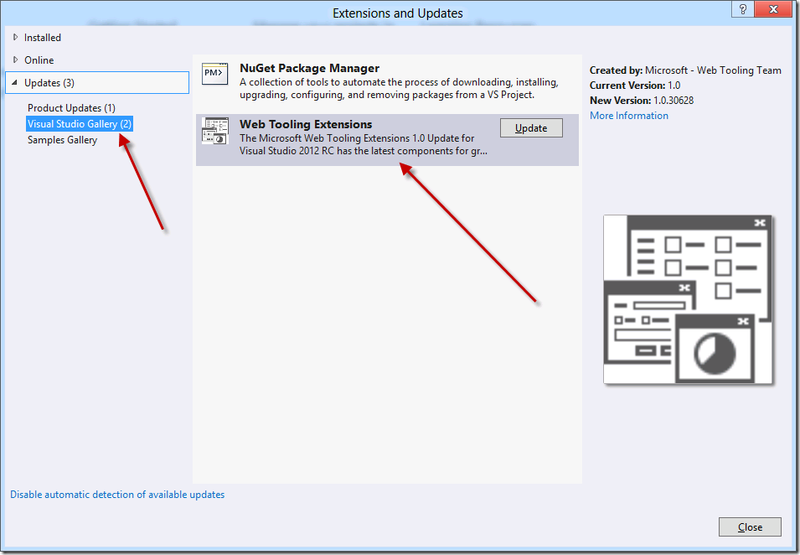 To get the web updates you should go to the Visual Studio Gallery tab and then click Update on the Web Tooling Extensions item. After installing the update you will need to restart VS. The goals that we had when creating this update mainly consisted of. Since the intent of this release was not to light up any new features you won’t find any new functionality, but you may discover that an issue you are running into has been fixed. Most of the bugs which we fixed were filed by customer on Microsoft Connect, though some came in through other channels. For the Connect bugs you will see a link to the bug details, for Connect bugs filed as private there will not be a link. Below you will find a list of the fixed bugs as well as a brief description of the bug. If the root web.config contained elements under <connectionStrings> that did not have a name attribute an exception was raised. When publishing a web project to the file system there are cases where files are not getting updated on publish. In certain cases if a web publish profile is read-only it can cause VS to crash. The drop down for Configuration on the publish dialog was mapped to Solution Configurations instead of Project Configurations. Because of this if a Solution Configuration was selected which did not have a corresponding Project Configuration the files would not be published. We have updated the dialog to show the correct value. We are really excited to be able to publish updates on a more regular basis and we hope that you will find that helpful as well. In case you guys were wondering if we listen to feedback/Connect bugs I hope that this post helps to show that we are listening to feedback and working to resolve bugs which get filed on Connect. Keep filing the bugs so that we can make our product even better. If you have already filed bugs on Connect then Thank You!